Part of Off the Shelf Festival, admission free. A chance to see and buy books not usually found in your local bookshop. Up the stairs (at the back of the barroom) at the Caledonia pub, Catharine Street, in the Georgian Quarter, Liverpool, £5, 7 pm spot-on start! ‘Metaforestry: storiau o’r Gogledd’ and DRKMTR, an experiment with poetry, visual art and sound. Tom Jenks is a poet with three collections published by if p then q: A Priori, * and Items. On Liberty, Repressed – an Oulipian treatment of On Liberty by John Stuart Mill, was recently published by The Knives Forks and Spoons Press. An Anatomy of Melancholy – a conceptual Twitter re-write of Robert Burton’s The Anatomy of Melancholy was followed by An Anatomy of Melancholy Book II – a second Twitter re-write, compiled in real time. By contrast, streak artefacts – a sequence of 100 poems of 10 lines with visuals – was published by Department Press. Jenks co-organises, with James Davies and Scott Thurston, The Other Roomexperimental poetry reading series and website and administer the avant objects imprint zimzalla. 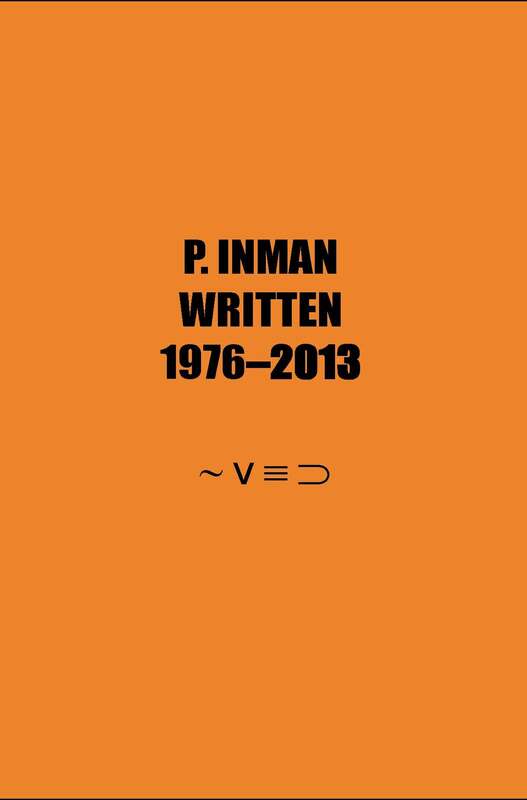 P. Inman’s Written 1976-2013 is published today by if p then q. The book is available for £20 and good postage rates are available both in the UK, USA and other locations. The volume offers an incredible introduction and reappraisal of the work of one of the twentieth and twenty first century’s most outstanding poets. It includes the collections: Platin, Ocker, Uneven Development, Think of One, Red Shift, Criss Cross, Vel, at. least., amounts. to., Ad Finitum and Per Se in ‘final’ versions, as well as a number of other previously uncollected poems. The volume also includes a sumptuous, lengthy essay by Craig Dworkin covering Inman’s career to date. Without a doubt it is essential reading. The collected P. Inman! It’s about time—and a lot of other words—many of which have never been seen or heard before. Inman’s half-century project of the complete dérèglement de tous la langue marks one of the endpoints of the great arc of American poetry, where the bow bends all the way to touch the ground. You’ll find a pot of linguistic gold there: Written is writing written at the limits of written writing. Accompanied by Craig Dworkin’s fantastic introductory essay, this book is sure to become a classic in the ongoing history of the avant-garde.